Colombia is to step up efforts to manage the Venezuelan migrant crisis by asking the United Nations to intervene, Foreign Minister Carlos Holmes Trujillo said on Wednesday. "We're going to continue to request the appointment of a special envoy... to coordinate a multilateral action to combat this humanitarian crisis," Holmes Trujillo told Blu Radio. Holmes Trujillo said the government would submit a proposal at the UN General Assembly in New York next month, while also pushing for the creation of "a multilateral emergency fund" to support the hundreds of thousands of Venezuelans risking perilous conditions to flee the economic crisis in their homeland. Colombia has already called on its southern neighbors, Ecuador and Peru, to agree on a common strategy to address the problem. More than two million people have fled food and medicine shortages as well as collapsing public services in Venezuela, the UN says. More than a million have entered Colombia in the last 16 months alone as Nicolas Maduro's Venezuela grapples with a four-year recession and hyperinflation. But Ecuador and Peru last week announced tightened border control measures, meaning thousands of Venezuelans have got stuck in Colombia, unable to continue their journey south. Colombia has given temporary residence to more than 800,000 Venezuelans but many of those hope to travel further afield to Peru, Chile and even Argentina. Around half of them aren't carrying passports but both Ecuador and Peru have said that will be a requirement now to enter their countries. Colombia's migration director, Christian Kruger said he was "worried about the consequences" of such a move. "Asking for a passport isn't going to stop migration because they're leaving their country not out of choice but out of necessity," he said. 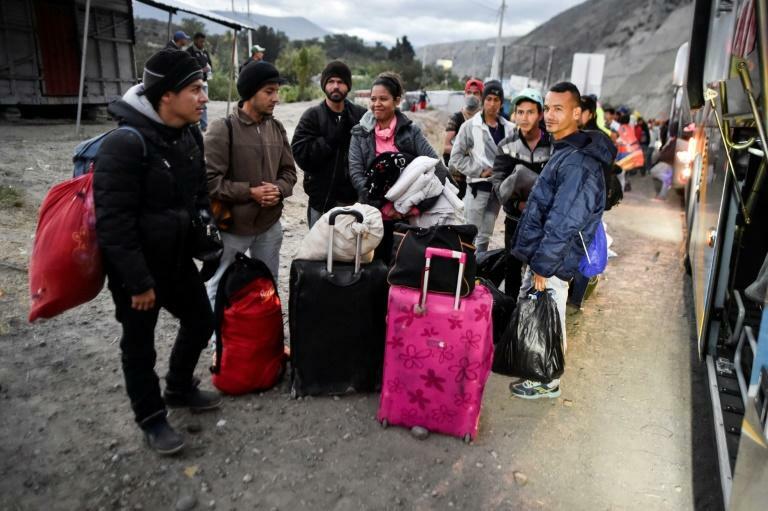 Ecuador announced on Tuesday it would organize a meeting of 13 Latin American countries to discuss the migrant crisis, with Venezuela invited alongside those most affected and regional giants such as Brazil, Argentina and Mexico.